The Power of Nutrition and the World Bank are supporting the Government of Côte d’Ivoire with a five-year, $60.4 million investment to increase the coverage of nutrition and early childhood stimulation interventions in selected areas in Côte d’Ivoire. It will support the implementation of Côte d’Ivoire’s Plan National Multisectoriel de Nutrition (PNMN), a wide-reaching health program. This investment will ultimately benefit up to 265,000 pregnant women and 1,100,000 children under 5. 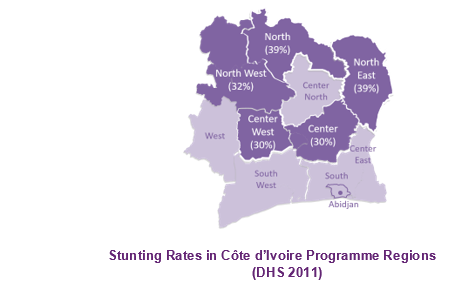 Figures for undernutrition in Côte d’Ivoire are among the worst in sub-Saharan Africa. The under-five mortality rate is high (93 per 1,000). Furthermore, the stunting level is 30%, while stunting in two poorer, rural regions in the north and northeast reaches nearly 40%. This plan will contribute to the reduction of stunting, anaemia and acute malnutrition in a number of high burden regions. This is a first-time large-scale investment in child nutrition and development in Côte d’Ivoire. In fact, until the year 2000, malnutrition was barely recognised as a public health problem. Today, the Ivorian Government have outlined their strong commitment to prioritising the fight against malnutrition. The country joined the Scaling Up Nutrition (SUN) movement in 2013 and established the National Nutrition Council (CNN) in 2014 which demonstrated a strong political commitment to tackle undernutrition. Moreover, the investment will utilise Results-Based Financing (RBF) for Public Health Nutrition, and will thus place a focus on results, making the government of Côte d’Ivoire directly accountable to The Power of Nutrition and its partners. After a decade of political crisis which ended in 2011, Côte d’Ivoire is trying hard to find stability by pushing economic and social development agendas. This investment will give new focus to deprived areas and will contribute to the development of human capital in the country. The Power of Nutrition’s innovative funding approach allows us to leverage funding from other partners. One of them, TRECC (Transforming Education in Cocoa Communities)* strive to improve the living conditions of all children and youth in Ivory Coast through quality education. Both TRECC and The Power of Nutrition recognised that whilst TRECC’s mission did not initially align at first, TRECC acknowledged the salience of nutrition (as outlined in the UN SDG’s) to improving future education and lives of children in Côte d’Ivoire, and realised this alignment by partnering with us. The investment provides a nutrition platform that is appealing and compelling to new private sector investors. Ultimately, it will help Côte d’Ivoire really see The Power of Nutrition. *TRECC (Transforming Education in Cocoa Communities) is a partnership between Jacobs Foundation (managing partner), Bernard Van Leer Foundation and UBS Optimus Foundation.